KENTUCKY TRANSPORT MISSION for FREEDOM is happening and your homes are urgently needed. Foster and forever families are needed to save the lives you see in these photos. Each one is holding space that is needed for new intakes. This high-kill shelter has limited kennels to house these lost souls which covers intakes from 4 counties in Kentucky. 4 animal controls depositing new lives faster than this shelter can get them back out to save them. Their hands are tied since so many homes have tossed away these weary spirits. So now we must come together to save as many as we can. They have so much left to share, give and experience. Please take a moment to consider being a foster home that will generate the impact of saving a life in dire need of support. Please comment then Email fostering@wagginghearts.org to open heart and home to one in need. Time is short, 24 hours is all we have to make this happen. Will you ACT NOW to save with us? Please share these faces…the light is fading, their time is short. Patrick’s Pups began with 1 heart. 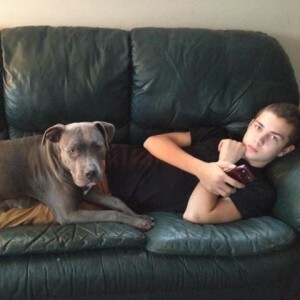 Patrick’s Pups started because of one young boy’s passionate heart for animals in need. Meet Patrick Raymond Boswell who died tragically on Friday, January 2nd, 2015 as a result of a random act of street violence. He was 14 years old and an eighth grade student at Iroquois Community School in Des Plaines, IL. He is survived by his mother, Patricia Frontain, his father, Robert Boswell, his sister Zoe Boswell, his many cousins, aunts, uncles and his grandmother. Let’s tell you a little bit about who Patrick was … he was an excellent athlete and played football for five years for the Maine Wast Junior Warriors where he was known for encouraging his team mates to do their best. He was often seen riding his dirt bike in his neighborhood. After the ride he would sit for hours and “tinker” with the bike. This brought to light a big talent for machine mechanics and he was excited to take an auto mechanics class in High School next year. Patrick loved rap music, clothes, Nike shoes AND … animals. He recently rescued a sweet dog found wandering who would have undoubtedly found herself headed to a high-kill shelter but instead found her way into Patrick and his families heart. He was especially delighted when they discovered a few weeks later that she would bless his family and their home with eight beautiful puppies!! But unfortunately Patrick would not witness his momma dog Diva’s pups grow up to be adopted into loving, forever families. Instead Patrick’s family was saying goodbye to their young son and entrusting his pups to Wagging Hearts so they could find their way into loving homes … just like Diva did all because one boy cared enough to act. Instead of standing by to watch her plight unfold. So in honor of the deep and loving heart within this boy, we present to you ‘Patrick’s Pups.’ A small way to honor the memory of one who left us too early with a heart full of desire to make a difference in the lives of animals in need. Now Patrick will make a difference in a great number of animals’ lives. His heart and mission to help those without will not fall into darkness nor end with the passing of his young life. Wagging Hearts will continue his work through the donations and proceeds generated in his memory. All proceeds will be used to save more lives, treat more medical cases and shine a brighter light into the darkest recesses of animal rescue. Patrick Raymond Boswell will live on in each life that comes our way because of the Patrick’s Pups funds. Come back often to see the impact he is making through the eyes of the animals he saves. Let’s remember the heart inside a boy who’s action’s would tragically transcend his life. Can be mailed to: Wagging Hearts at 260 E. Belvidere Rd., #369, Hanisville, Illinois 60030. Or feel free to visit our website to read more about Wagging Hearts and donate online. http://wagginghearts.org/about-us/. 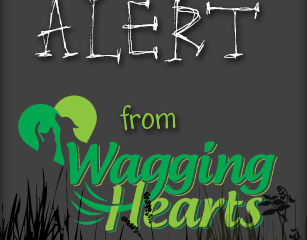 Can be directed to contactus@wagginghearts.org or feel free to call (855) WAGGING. Fosters Needed!! One heart, One home. Foster homes are urgently needed for the following beautiful spirits who were rescued to save their lives and now await their own very own home to lay their weary bodies upon. All are in boarding and would love to know what it means to feel the peace and quiet of a loving home. A soft floor to lie upon and a hand to hold them close. Each one is looking for guidance and care to set them on their right path to forever love. Please help us connect each one with a heart that will carve out a spot in their home. Please email fostering@wagginghearts.org to start a discussion on how you can open your home to a life in need today!! Don’t delay and make one of these beautiful lives a part of your family today! Email and start a discussion with a coordiantor that can answer your questions. Beautiful weather, night sky with start above and the sweet croon of James Taylor!! A very generous friend has given Wagging Hearts 4 tickets to tonight’s (June 27, 2014) SOLD OUT James Taylor Concert at Ravinia in Highland Park, IL. We are pawing them forward to help raise money for our newest medical intake sweet Reno, the Wagging Hearts furbaby currently in critical condition. (2 @ $25 each). Tickets will be sold in pairs (of 2). Thank you Kristen OBrien for the amazing donation!! PLEASE SHARE & CROSSPOST with family and friends in the Chicagoland area. In Vino Caritas – In wine, there is charity. IN VINO CARITAS … In wine, there is charity. Continue to take in serious medical situations injured through circumstance, neglect or abuse. Provide continued and consistent vetting care to the adoptables currently awaiting forever love. Rescue, rehab and recover the shattered lives of animal victims like Jack Sparrow, Faith, Renny and so many more. Stay for wine tasting, appetizers and raffle auction for 10 give-away gifts!! Preorder your raffle tickets through the Wagging Hearts PayPal link accessible at wagginghearts.org or head over to our FB page to join event. Wagging Hearts can’t take all the medical, all the injured, all the neglected … but we can make a difference in the lives we can save, change & heal. Be a part of making a difference on Friday, June 20th. Share our flyer to invite others to raise a glass! Fostering is a true gift to all who are involved. A lost dog or cat finds their solid footing, all be it temporarily, with a family while they wait for forever love to find them. They wake each morning as part of something bigger than the world they were once a part of or lost within. Brought from the chaos, stress and anxiety of the shelter environment into the outstretched arms of an awaiting family whose role it is to help that life get back on track. This transition time is something to behold as many arrive scared and confused. Adrift from anyone that they can call their own. Then in steps their foster family to provide consistent food, clean water, kisses & cuddles, toys. … a whole new world opens up and the personality changes that begin to show are miraculous. You literally witness another life find their footing and then take off running toward their new horizons of opportunities. They jump with joy, they prance with happiness, they smile with hope. Alexis – Around 6 months old, Chi mix, up-to-date on her shots. A little lover who is yearning to find a home of her very own. Please consider opening your home to Alexis as she is small, sweet and happy to be your cuddle buddy. Barbara – Around 1 year old, Lab/Shep, up-to-date on her shots and spayed, crate- & house-trained, LOVES kids, enjoys running around in the backyard with a ball or toy, no other dogs as she can be reactive/no cats as she will chase. Happy to lay in the sun at your feet watching the world go by out the window. Good on lead but can get vocal/energetic when others approach. Jack – Around a year old, Chihuahua, up-to-date on his shots, crate-trained, very emaciated and food motivated. Clearly life was not kind to this little man and he is wary of new people. Opens up beautifully with a gentle approach and tone. No kids under the age of 15 for Calhoun. This is one of those souls who will blossom under the right guidance and heart. Bryson – Around a year old, Lab Ret, up-to-date on his shots and neutered, crate-trained, LOVES kids, high energy level with ability to refocus, dog-, cat-, kid-friendly. Needs to be with another companion animal as this gives Bryson a sense of balance & a playmate to burn off some of his energy. Would be great for a family with a stay-at-home parent who wants a companion to share the day with. Charlie – Less than a year old, Pittie, up-to-date on his shots & neutered, crate-trained, has a playful personality with such love in his heart. Dog- and kid-friendly. Pulls a little on leash but can be corrected with guidance and a harness helps control Charlie. Very smart boy looking for a family and a home to settle into until his forever family finds him. Sheeba – Around 3 years old, Pittie, up-to-date on her shots, needs to be the only dog in the home as she can be a bit snarky with others though very easily redirected. Curious about cats but does not seem to mind their presence. Loves to cuddle most of all and will sink her head into your hand or chest for deep moments of interaction. This is a girl with a deep heart who wants nothing more than to share the rest of her life with a heart made just for her. Spud – Around 3 years old, Pittie. healing from having multiple tumors removed from his body. Slow-growing cancer has been diagnosed for Spud. A sweet and loving boy at around 55 pounds. A heart that knows how to provide smooches galore and would like nothing more than to lay gently in your arms while he drifts off to sleep knowing he is finally safe. Particular to the cool grass outside with the sun on his back and a loving heart near by. Please email fostering@wagginghearts.org if you can help one of these sweet lives in need of your soft, delicious, loving foster home. This will be a gift that keeps giving way beyond your time in their lives. Please consider helping today. Dollars for Dandy is a medical fundraiser to assist Wagging Hearts with a new soul who was surrendered after he was severely attacked by another companion animal. Dandy sustained serious injuries to his body and most especially to his right, front leg which is almost lost. In essence, Dandy was degloved from the knee to the bottom of his right leg. This means he had no skin, no tissue, no muscle left. He cried but not a snarl, not a nibble, not a growl to anyone that helped Dandy after the incident and moving him toward help. 2 plasma bags upon intake to stabilize him at the emergency clinic and a scary first night brought this boy to our door. A voice in trouble reaches out to us in an urgent plea to assist with Dandy, as his very life hangs in the balance, and immediate care is sought for Dandy through Wagging Hearts. This beautiful boy in now a part of Wagging Hearts rescue and we are asking for any amount of dollars for Dandy to help with his extensive medical care. We have watched this gentle boy be a sublime friend, guide and mentor to our intakes that passed through his home and life. We just simply could not let Dandy down. Photos to come, updates to follow. Please take a moment to consider helping Wagging Hearts cover the growing medical costs to insure Dandy wins this fight for his life. Our rescue has taken in a considerable amount of medical cases over the last several months inclusive to prolapsed uterus/tumor, gun shot wounds, blunt force trauma, amputated legs, knife wounds as well as neglect and cruelty cases … the list goes on. We cannot do this alone as these lives deserve a hand to hold and a voice to call out on their behalf. We are their voice and you have the potentially to be their helping hand. 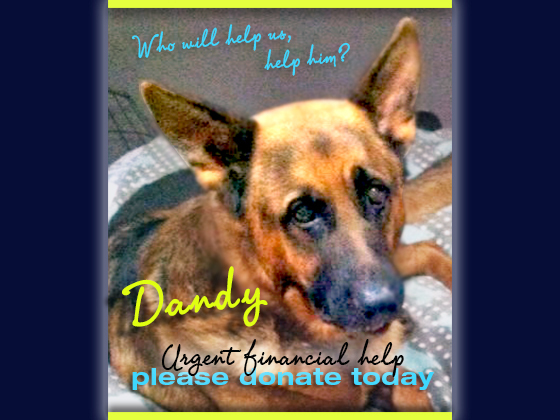 Please visit our fundraiser and help us raise dollars for Dandy. Every dollar counts and every dollar counts. Thank you all for sharing this urgent need. 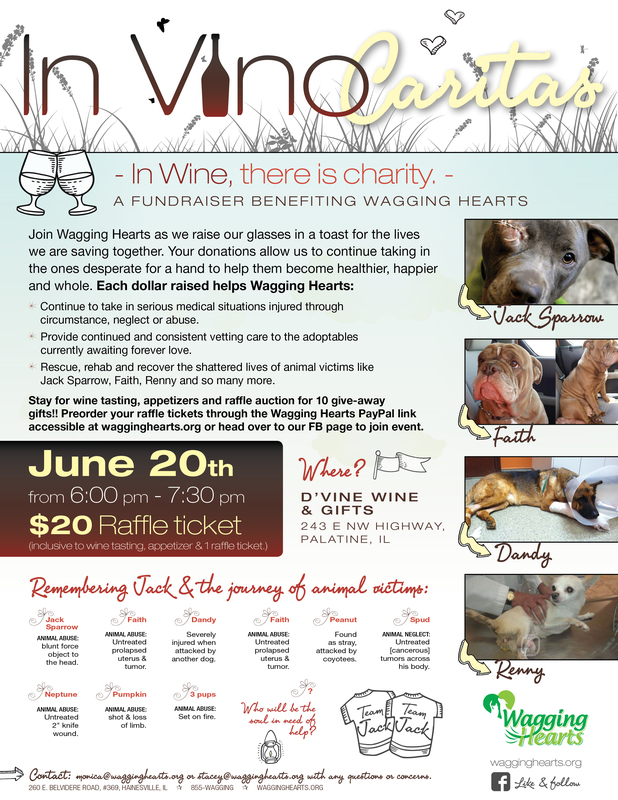 Please direct any questions, concerns or additional information to contactus@wagginghearts.org. Are YOU aware of the hidden dangers spring can bring? Diligence is key and knowledge is power. Please take a minute to visit our Blastomycosis post to become familiar with this hidden danger. We have personally felt the impact of losing one to this deadly fungal infection. This is an alert to become aware of the hazardous environments that can have life-altering consequences for your pet if you are not careful to watch for the signs and symptoms. LEPTOSPORISIS: It’s not just a brochure at your vets office. It’s real and deadly. Or perhaps you might visit a NBC news article on Leptosporisis and become aware of the signs and symptoms of this deadly infection. Are your animals vaccinated from its potentially life-threatening effects? Ask your veterinarian today and inquire on the assistance this vaccination provides for the protection of your pet. Let’s keep our family members safe through sharing and updating each other on the ever evolving ways to protect our loved ones. Who is going to come out and meet our adorable adoptables this weekend!! Don’t miss our 2-day adoption event jammed pack with more lives seeking forever love wrapped in a forever home. Saturday, March 8th from 11 AM – 4 PM and then again on Sunday, March 9th from 11 AM – 3 PM at the Petco in Round Lake Beach, IL. Visit with us, cuddle with a pup, connect with an adorable adoptable and make an impact. Check out our Facebook page to see who will be onsite each day and fill out an adoption or foster application ahead of time. Don’t forget to LIKE us and follow our impact. Come prepared and leave with a new life shining bright with happiness and joy. Don’t miss this opportunity to find another piece of your heart. Adopt, foster, support. What will your impact be? FOSTER HOMES needed for: Apollo, Barbara, Bryson, Lokie and Ninja (photos to come, brand new adoptable). Consider donating to a phenomenal cause like ‘Caring for Carter’. Email questions to contactus@wagginghearts.org. We hope to see you there! !